(17/P11) TRENTON – Bald eagle and osprey populations continue to reach record highs in New Jersey, according to surveys conducted by the Department of Environmental Protection’s Endangered and Nongame Species Program and the Conserve Wildlife Foundation of New Jersey. 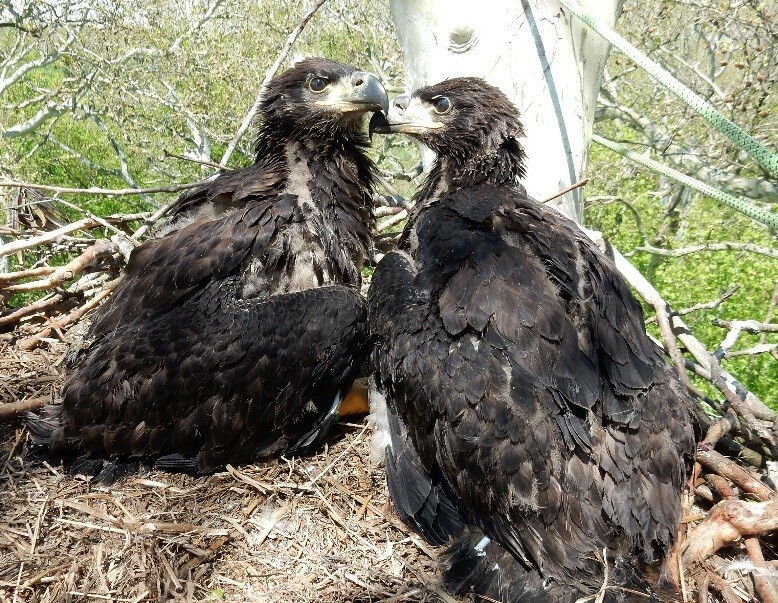 The surveys of eagle and osprey populations and nest sites conducted last year documented 172 nesting or territorial pairs of bald eagles in New Jersey, up from 161 the previous year, with southern New Jersey, especially the Delaware Bay region, remaining the species’ stronghold. In addition, 42 new osprey nests were counted, for a record total of 515. The Atlantic coast – in particular the wetlands and waterways around Barnegat Bay and Great Egg Harbor – accounted for the vast majority of nests. The Endangered and Nongame Species Program’s efforts protecting these and a wide variety of other species depend in large part on funds provided by the Endangered Wildlife Fund state income-tax check-off, which allows taxpayers to provide a portion of their state refunds to fund wildlife protection. The Endangered Wildlife Fund check-off is on Line 59 of Form NJ-1040. Taxpayers are provided the option of contributing $10, $20, or an amount of his or her choosing, toward protection of threatened and endangered species. The recovery of eagles and ospreys is largely the result of a decades-old ban on DDT, a once widely-used pesticide that caused egg failure. But the species have needed a lot of nurturing along the way, including programs to incubate eggs in laboratory settings and intensive monitoring of nest sites. The Endangered and Nongame Species Program also works to identify habitats that are critical to support the state’s bald eagle nesting and wintering populations. Among the state’s endangered species wildlife recoveries, perhaps none have been as dramatic as that of the bald eagle. In 1982, there was just one nest left in the state, in Cumberland County’s Bear Swamp, and that nest repeatedly failed due to DDT. Eagles were ultimately brought in from Canada to begin rebuilding New Jersey’s population. In 2016, a record 172 pairs of nests were counted, up from 161 in 2015 and continuing the trend of new nests being identified ever. Of these, 150 actively nested, and the remainder were in the process of establishing nesting territories before, which is part of the species biological behavior. The active nests produced a total of 216 eagle chicks. The majority of the state’s nests are in southern New Jersey. Nearly half of the nests are found in the Delaware Bay region – believed to be the species’ historic stronghold prior to steep DDT-related declines. Both eagles and osprey depend primarily upon fish for survival. The DDT ban eliminated a toxin that accumulated in the tissue of fish that eagles ate and caused their eggs to become brittle and fail. The trend for the osprey, a primarily coastal bird-of-prey, continues to be equally uplifting. 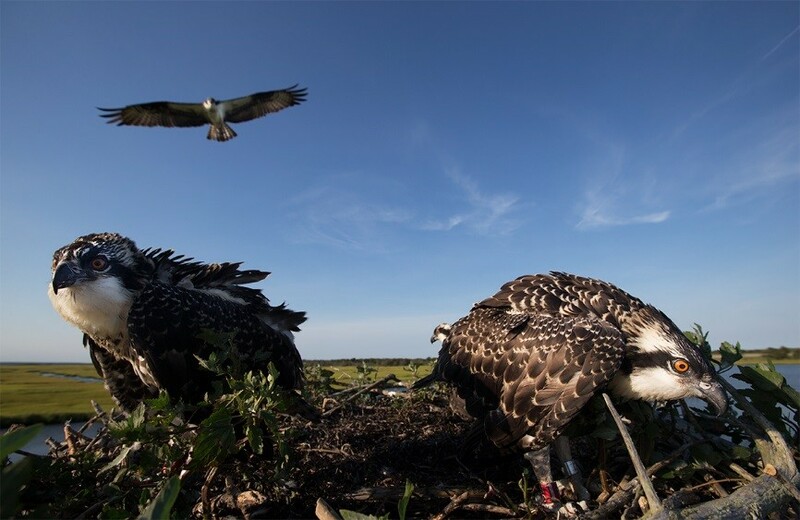 During the osprey survey conducted last June and July, volunteers and staff checked nests from Sandy Hook to Cape May, and then up Delaware Bay to record nest occupancy and success. Of the 515 nests counted statewide, the majority – 316 – are found along the Atlantic coastline. Notably, the survey confirmed that osprey in the Barnegat Bay area tagged with special red bands are increasingly using the bay for nesting. The Barnegat Bay region and Sedge Islands Wildlife Management Area located in the bay adjacent to Island Beach State Park accounted for 102 of the state’s counted nests. This three-year-old project, known as Project RedBand, is designed to chart the migration, feeding patterns, lifespans and nesting patterns of osprey in the ecologically important Barnegat Bay region while engaging the public in the recovery of this species through the special bands that can be identified from a distance. The nests that were counted during the statewide survey are believed to account for at least 80 percent of the nests actually present in the state. Detailed data collected from 376 of the nests showed that 670 chicks were hatched, for an average 1.78 young per nest, more than twice the rate needed to sustain a stable population. A total of 361 young were banded for future tracking. Volunteers work to build and maintain osprey nest platforms that have helped greatly in the recovery of the species. For more information about the Conserve Wildlife Matching Grant Program, visit: www.nj.gov/fgw/ensp/cwgrants.htm or call (609) 292-9400.